This is evident in the case of the word “secular.” We think of “secularization” as a selfsame process that can occur anywhere (and, according to some people, is occurring everywhere). And we think of secularist regimes as an option for any country, whether or not they are actually adopted. And certainly, these words crop up everywhere. But do they really mean the same thing in each iteration? Are there not, rather, subtle differences, which can bedevil cross-cultural discussions of these matters? I think that there are and that they do create problems for our understanding. Either we stumble through tangles of cross-purposes, or else a rather minimal awareness of significant differences can lead us to draw far-reaching conclusions that are very far from the realities we seek to describe. 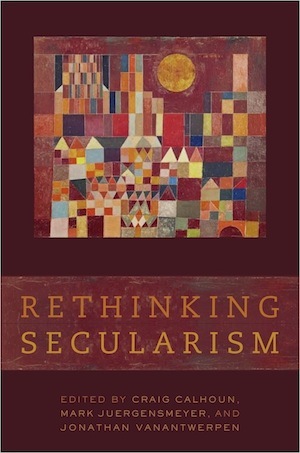 Such is the case, for instance, when people argue that since the “secular” is an old category of Christian culture and since Islam doesn’t seem to have a corresponding category, therefore Islamic societies cannot adopt secular regimes. Obviously, they would not be just like those in Christendom, but maybe the idea, rather than being locally restricted, can travel across borders in an inventive and imaginative way. Let’s look at some of the features of the “secular” as a category that developed within Latin Christendom. First, it was one term of a dyad. The secular had to do with the “century”—that is, with profane time—and it was contrasted with what related to the eternal, or to sacred time. Certain times, places, persons, institutions, and actions were seen as closely related to the sacred or higher time, and others were seen as pertaining to profane time alone. That’s why the same distinction could often be made by use of the dyad “spiritual/temporal” (e.g., the state as the “temporal arm” of the church). Ordinary parish priests are thus “secular” because they operate out there in the “century,” as against those in monastic institutions—“regular” priests—who live by the rules of their order. So there is an obvious meaning of “secularization” that dates from the aftermath of the Reformation. It refers specifically, in this sense, to when certain functions, properties, and institutions were transferred from church control to that of laymen. These moves were originally made within a system held in place by the overarching dyad; things were moved from one niche to another within a standing system of niches. This configuration of the “secular,” where it still holds, can make secularization a relatively undramatic affair, a rearrangement of the furniture in a space whose basic features remain unchanged. But from the seventeenth century on, a new possibility gradually arose: a conception of social life in which the “secular” was all there was. Since “secular” originally referred to profane or ordinary time, in contradistinction to higher times, what was necessary was to come to understand profane time without any reference to higher times. The word could go on being used, but its meaning was profoundly changed, because its counterpoint had been fundamentally altered. The contrast was no longer with another temporal dimension, in which “spiritual” institutions had their niche; rather, the secular was, in its new sense, opposed to any claim made in the name of something transcendent of this world and its interests. Needless to say, those who imagined a “secular” world in this sense saw such claims as ultimately unfounded and only to be tolerated to the extent that they did not challenge the interests of worldly powers and human well-being. Because many people went on believing in the transcendent, however, it was necessary for churches to continue to have a place in the social order. They could be essential in their own way to the functioning of society, but this functioning was to be understood exclusively in terms of “this-worldly” goals and values (peace, prosperity, growth, flourishing, etc.). This shift entailed two important changes: first, it brought a new conception of good social and political order, which was unconnected to either the traditional ethics of the good life or the specifically Christian notion of perfection (sainthood). This was the new post-Grotian idea of a society formed of and by individuals in order to meet their needs for security and the means to life. The criterion of a good society in this outlook, mutual benefit, was not only emphatically “this-worldly” but also unconcerned with “virtue” in the traditional sense. The hiving off of a specifically “earthly” criterion figured within a broader distinction, that which divided “this world,” or the immanent, from the transcendent. This very clear-cut distinction is itself a product of the development of Latin Christendom and has become part of our way of seeing things in the West. We tend to apply it universally, even though no distinction this hard and fast has existed in any other human culture in history. What does seem, indeed, to exist universally is some distinction between higher beings (spirits) and realms and the everyday world we see immediately around us. But these are not usually sorted out into two distinct domains, such that the lower one can be taken as a system understandable purely in its own terms. Rather, the levels usually interpenetrate, and the lower cannot be understood without reference to the higher. To take an example from the realm of philosophy, for Plato, the existence and development of the things around us can only be understood in terms of their corresponding Ideas, and these exist in a realm outside time. The clear separation of an immanent from a transcendent order is one of the inventions (for better or worse) of Latin Christendom. The new understanding of the secular that I have been describing builds on this separation. It affirms, in effect, that the “lower,” immanent or secular, order is all that there is and that the higher, or transcendent, is a human invention. Obviously, the prior invention of a clear-cut distinction between these levels prepared the ground for the “declaration of independence” of the immanent. At first, the independence claimed on the part of the immanent was limited and partial. In the “Deist” version of this claim, widespread in the eighteenth century, God was seen as the artificer of the immanent order. Since he is the creator, the natural order stands as a proof of his existence; and since the proper human order of mutual benefit is one that he designs and recommends, we follow his will in building it. Furthermore, it is still affirmed that he backs up his law with the rewards and punishments of the next life. The attempts of eighteenth-century “enlightened” rulers, such as Frederick the Great and Joseph II, to “rationalize” religious institutions—in effect, treating the church as a department of the state—belong to this earlier phase of secularization in the West. So, too, in a quite different fashion, does the founding of the American republic, with its separation of church and state. But the first unambiguous assertion of the self-sufficiency of the secular came with the radical phases of the French Revolution. The polemical assertion of secularity returns in the Third Republic, whose laïcité is founded on the ideas of the self-sufficiency of the secular and the exclusion of religion. Marcel Gauchet shows how Renouvier laid the grounds for the outlook of the Third Republic radicals in their battle against the church. The state has to be “moral et enseignant.” It has “charge d’âmes aussi bien que toute Église ou communauté, mais à titre plus universel.” Morality is the key criterion. In order not to be subordinate to the church, the state must have “une morale indépendante de toute religion” and must enjoy a “suprématie morale” in relation to all religions. The basis of this morality is liberty, and in order to hold its own before religion, the morality legitimizing the state has to be based on more than just utility or feeling; it needs a “théologie rationnelle,” like that of Kant. Needless to say, this spirit goes marching on in contemporary France, as one can see in the ongoing debate over banning the Muslim headscarf. The insistence is still that the public spaces in which citizens meet must be purified of any religious reference. And so the history of this term “secular” in the West is complex and ambiguous. It starts off as one term in a dyad that distinguishes two dimensions of existence, identifying them by the particular type of time that is essential to each. But from the foundation of this clear distinction between the immanent and the transcendent, there develops another dyad, in which “secular” refers to what pertains to a self-sufficient, immanent sphere and is contrasted with what relates to the transcendent realm (often identified as “religious”). This binary can then undergo a further mutation, via a denial of the transcendent level, into a dyad in which one term refers to the real (“secular”), and the other refers to what is merely invented (“religious”); or where “secular” refers to the institutions we really require to live in “this world,” and “religious” or “ecclesial” refers to optional accessories, which often disturb the course of this-worldly life. Through this double mutation, the dyad itself is profoundly transformed; in the first case, both sides are real and indispensable dimensions of life and society. The dyad is thus “internal,” in the sense that each term is impossible without the other, like right and left or up and down. After the mutations, the dyad becomes “external”; secular and religious are opposed as true and false or necessary and superfluous. The goal of policy becomes, in many cases, to abolish one while conserving the other.